The winter of 2009/2010 seemed to go on for absolutely ages. 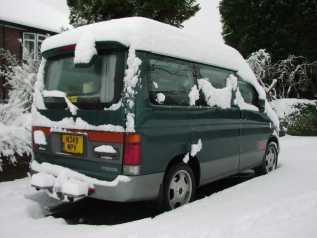 Many Bongonauts were stuck in the snow and ice, yet many Bongo owners had to rely on their vehicles for getting about. Here are a few of their tales, collected from the Bongo Forum. Mobilecat: I live on a steep hill, and have a drive that slopes down from the hill. When the snow first hit I thought I would be fine. I know from the last two years that she drives and handles beautifully on the snow and the ice so I wasn’t worried. But I was wrong. My first problem was on Tuesday. After driving back down my drive, I compressed the ice and got stuck for 4 days until someone was able to help dig me out as the thaw started. Now I hit my second bad one. I have been using her last week no problem and over the weekend my whole estate got iced over. I left her on the road like a good girl last night, to avoid the previous problem of being stuck again as it’s about -5 here today. Problem – side door frozen shut, plus all of my windows, except the back one were thick with ice inside and out and I had no chance. Even if I had my 12v heater (which I lent to a friend last week and get back later this morning) I don’t think I would have had a chance. So once again – I am reliant on a friend for the school run. 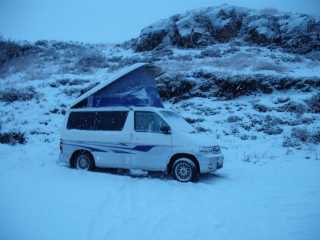 Ron Miel: Please don’t start sticking pins in an effigy of me, peeps – but I’m really finding out now just what the remote start which came with our Bongo is all about. I am leaving my heaters and rear de-mister set when I park up at home, at the moment. To defrost thoroughly, I can then just point the remote out of a (closed) window indoors, and watch the Bongo get all toastie for us before we have to go anywhere near it. In the camping season, the remote start is brilliant for AFT up/AFT down engine runs, without having to clamber round to the front – especially if the wind has got up in the night, and the roof needs to come down quickly. Has anybody fitted an aftermarket remote start system, which I think you can get? Worthwhile piece of kit, if you can. Munroman: It’s been cold up here in Central Scotland, and I have been using the Bongo every day, sometimes to get out hill walking, sometimes to do ‘Dad’s Taxi’ stuff, sometimes to get shopping, and it has been great, yesterday it carried 6 of us and gear up and down a 3 mile ice rutted track without a whimper. Lift the wiper blades and give the edges a little wipe, and don’t think you can scrape ice with them, the ice always wins! Door seals, etc, a little glycerine, or even a rub of candle wax can help them stop sticking. If you do a lot of short journeys, the Bongo never really gets a good drying out, I found I was getting a lot of condensation, I suspect that the rear exit vents were perhaps iced closed, so I ran with the side windows popped open and this cleared things. Keep wiping the lights and number plates, it is amazing what crud builds up on them, but a clean rear lens might help someone see your brake lights a fraction earlier and avoid a bump. Finally, please try and get any snow and ice off your roof before setting off, unlike the Skoda on the A9 today with about 2 ft of snow just ready to either fall onto his windscreen, or fly off and hit the car following, another minute would have got rid of that hazard. These are not conditions many people have seen for a long time or perhaps ever, but with some simple changes of habit it is possible to carry on safely enjoying the Bongo in all weathers. Bigdaddycain: I actually HAD to use my 4WD bongo this morning as the guy from Asda phoned to say they wouldn’t be delivering our shopping today because of the weather conditions, so the missus insisted I went to get some tide-over provisions. I couldn’t believe just how well the Bongo coped! I must admit I didn’t expect much from it to be honest… I’m on very low profile sports tyres (small sidewall, minimum flex, less grip) And they were still inflated to 45PSI! So it was with much trepidation that I set off on the admittedly small mile and a half trip to my local Morrisons… It wasn’t the Bongo’s abilities I had to worry about, it was rear wheel drive cars that was blocking all the roads (again stuck up against the kerb). And vans. Picture this scenario: there is an increasingly steep gradient leading to our Morrisons, the road is maybe half a mile long. This was ram-jammed with stuck, or abandoned vehicles as far as the eye can see. At the head of the queue was a jack-knifed articulated lorry blocking the way. I sat at the end of the queue patiently waiting for enough room (and grip) to become available to do a “U-Turn”. Then some smarta** just HAD to do it didn’t they??? Up came a silver BMW X5 on the wrong side of the road with that “move out of the way peasants! I’m a 4X4 with considerably more money than you” attitude… and duly got stuck trying to get around the stricken lorry COMPLETELY BLOCKING THE ROAD! Well… that was it… Like a bull to a red rag, my bongo WAS gonna make it to that damn shop! SO off I went, past ALL the stuck and abandoned cars, up behind the (by now sliding backwards X5) up onto the kerb, then along the grass verge (with a banking into a field), back down the kerb, past the stricken truck, with a quick slip of the handbrake to make the 90 degree left hander into the entrance to Morrisons, plenty of power on to keep the traction minimal at the back, a bucket full of opposite lock, and the bongo straightened up perfectly, on cue to glide straight into the virtually empty car park! 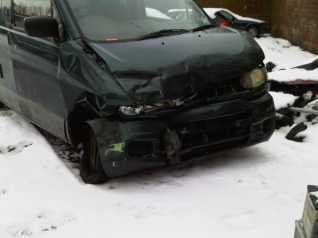 That bongo made me look like a stunt driver! All credit goes to the vehicle, NOT my driving skills. The trip back out wasn’t anywhere near as eventful… I’m sure I overheard one of the stranded motorists say that an X5 driver had melted the snow on the road with the steam that was coming out of his ears! Dandywarhol: Here’s atip for driving in ice and snow if you have an automatic Bongo. 1st and HOLD will lock the ‘box in first. 2 and HOLD locks the ‘box in second. 3 and HOLD starts the ‘box in second and quickly shifts to third and locks there until you come to a standstill and it repeats itself. Croylo: Towing a horsebox from Fort william to Inverness yesterday with a 2.5 manual Bongo 4×4, about 2-3 inches of snow, no gritters, hit black ice at Laggan, Bongo and horsebox spinning bumped verges a bit with both Bongo and horsebox but finished up perfectly straight facing the other way. Horsebox hitch is a bit bent but Bongo unscathed. Went on to travel along A82 twice more in the untreated snow, not pleasant but as long as you never brake and control your speed with the gears, quite manageable. Oh I have Kumo tyres by the way. Harry: The current cold snap has brought to mind my first ever bongo overheat back in ancient history. It was the first severe frost following a summer/autumn driving back and forth to Southern France from the Lake District every couple of weeks. My anti freeze practically non existent having frequently topped with water during a long hot holiday season. What happened? Sub zero early morning….drove about five hilly/fast miles fully loaded before noticing steam/water vapour coming from under bonnet. Pulled in immediately and decided to let things cool down before removing coolant tank lid. Steam escaping under pressure from coolant overflow vent. Checked hoses for leaks…no leaks but bottom hose ICE COLD and RIGID. Once steam had subsided topped up tank with warm water from kettle. Didn’t know about bleeding in them days. Rechecked hoses and found bottom hose was no longer cold and was now flexible. Conclusion (later confirmed by garage) was that the bottom hose had frozen solid thus preventing circulation of coolant when the thermostat should have opened as engine reached working temp. Bottom hose had thawed out whilst we had stopped due to heat from engine. Moral….make sure that your anti freeze is up to strength and make sure it has circulated throughout the system. 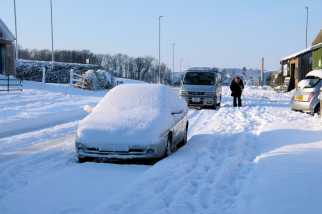 Travis: Our other car is an Astra and other little ones in the road have been driving up and down our icy road all day. I had to pick my daughter up from town today my wife was out so I fired up the silver surfer. I got him going and the first left turn I took he slid right across the road and just missed a lamp post. I was able to reverse back and slid into a safe parking spot up the street. Is it the front wheel drive, the automatic gears or is it me? Make sure that you get some weight in the back over the rear axle. I used my bongo as a delivery van carrying up to half a ton of birdseed. Fully loaded it was fine…empty it had no drive wheel grip at all. Also put it into one of the lower gears and try not to touch the brakes. 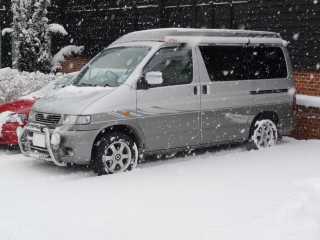 I have a 2WD Bongo and it doesn’t do that but then it has some decent all-season tyres fitted. As Ron Meil will confirm the difference is astounding. Ron Miel: just read right down this thread, intending to say what scanner has said, when I got to the bottom – but he’s already said it. I’ve been out a lot on snow and ice, and some inclines, yesterday and today, and the traction with the Quatrac 2’s is very impressive indeed (2wd). I haven’t crawled around but, touch wood, I haven’t yet lost drive traction once, and the ABS has only activated very briefly, and still perfectly steerably, a couple of times. Although, if you accelerate or decelerate (including transversely in cornering) clumsily, nothing will save you on ice, if your control is good and the tyre tread is still working at low temperature (which is what Quatrac 2’s are about), ice driving is perfectly possible. The limits are just much lower with summer tyres on ice. I have always found it best, with automatics, to avoid all possibility of unforeseen/uncontrolled engine driven effects on slow speed icy turns. I’m finding exactly the same with the Bongo – get down to the safe speed (if there is one!) for the turn in plenty of time beforehand (if it’s icy just bleed off the momentum without braking), shift into neutral while you are actually turning, and just use very gentle progressive steering inputs to get you round. With a manual, you can achieve the same effect by declutching. Otherwise, the engine is still driving the rear wheels as you turn, and the effect of that is both unpredictable and outside your control. If you get it right, the engine isn’t working against you. If you don’t get it right, then skid recovery afterwards is purely down to your steering skill, without that unpredictable element making it more difficult. Mikeonb4c: I’ve found moving off in ‘L’ reduces chances of slipping while pulling away, and then careful deceleration moving through ‘S’ and ‘L’, finally with HOLD when in ‘L’, works really well for slowing right down on snow and ice. I hardly use the brakes.